One day if I go to heaven, I'll look around and say “It ain't bad, but it ain't San Francisco”. Crab season starts in early November in San Francisco. If you're lucky enough to reside in the “cool, grey city of love” you can just pop down to Fisherman's Wharf or Chinatown and pick up fresh crabs for dinner. If you're not in the Bay Area, try an Asian market. I just looked it up and there are two Asian markets in Las Vegas (where I live now) that sell live crabs. We will definitely be having some crab dinners this holiday season. Dungeness crabs served the San Francisco way come with lots of melted butter and a loaf of crusty real sourdough bread (another San Francisco tradition). In addition to being delicious, crabs are also very nutritious. Dungeness crabs are rich in vitamin B-12 and lots of minerals. It's best to buy live crabs because this way you know they are fresh. 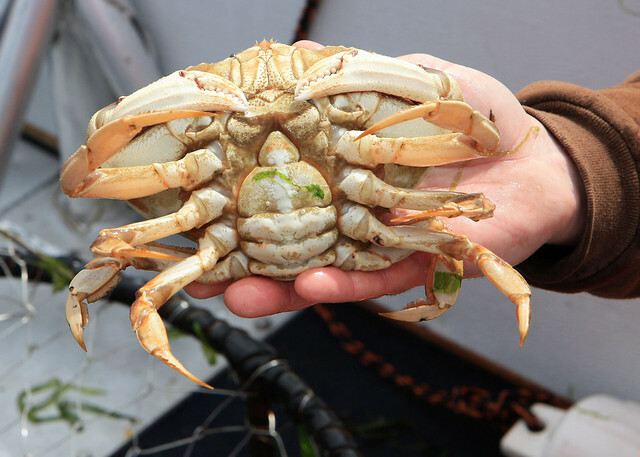 When choosing a live Dungeness crab, look for the lively ones. Avoid listless crabs. If you can't find live crabs, you can also buy crabs that have been pre-cooked. Look for crabs that have their legs curled up underneath them. This is a sign the crab was cooked alive, which is what you want. Crabs cooked after they die are probably bad. 1. Add filtered water to a large stock pot. There should be enough water so that the crab is completely submerged, plus an additional 4 or 5 inches. Use about half a cup of salt per gallon of water. If you prefer, you can also steam the crabs — just use less water, set them on a rack in the pot, and cover. 2. Bring to a boil on high heat. 3. Place crabs carefully in liquid. 4. Cook for 15 to 20 minutes or until crabs turn bright orange. 6. Serve with cut lemon wedges, bowls of melted butter, and warm sourdough bread. NOTE: If using pre-cooked crabs, just put them in the salted water for 5 minutes to reheat. 1. Throw away the intestine, which runs down the center of the back. 2. Most people wash away the “crab butter” (the yellow stuff in the cavity). But these organs are a delicacy and are very nutritious. Give it a try! 3. Use a mallet to crack the legs. 4. Use a small fork or pick to dig out the meat. 5. Eating crab is messy. Make sure you have plenty of napkins on hand. If you have kids, you may want to lay down some newspaper or butcher paper on the table and let them have at it. Have fun with it! Here's a good post with pictures that explains in detail how to clean the crab. Be sure to save the shells to make crab stock! Just freeze until you are ready to use. Similar to lobster stock, this makes a delicious and nutrient-dense bone broth you can use for seafood soups and stews, risotto, sauces, and other dishes. That sounds nutririous but difficult…was it “hard” to steam/boil a live animal, did it “bother” you? I’m not saying I don’t agree with it but I’m not sure I could do it myself. Did I ask you what your opinion is of the nutritional value of the smoked oysters at Trader Joe’s? It seems like smoking is not as hot as cooking and maybe wouldn’t kill of of the good stuff, what do you think? Lori, if you can verify that they are truly smoked, and not cooked and flavored, they will be just fine. Smoking seafood is very traditional here in Alaska. I found this info about the oysters I eat and I get them at Trader Joes, they are a delicious snack. Thanks again Paula, for your 2 cents! It isn’t hard for me. My mom and dad used to boil lobster when I was little. They let me pick up the lobster when I was like 3 or 4. Mmmm! I have had Dungeness one time, and that was when I was visiting Echo Ranch Bible Camp down near Juneau, Alaska. Fresh out of the water, into the stock pots and onto the tables. There were probably well over 50 people there, and we had enough to stuff ourselves. Totally ruined me on all other crab for life, lol! Oh YUM! Lucky, you, Paula! Oh this is just the most heavenly food on earth! My daughter had her first crab in San Fran this August and she always talks about how amazing it was. I wish we could get it as fresh here in LA. Time to start looking around for sources! There are lots of Asian markets in LA where you can find them. something i’ve wondered about with crab and other shellfish, is that i’ve read that they are “bottom feeders” and can accumulate toxins, but i’ve also read that amongst the weston price crowd they are considered to be very nutritious. i worry about the pollution and wonder if it’s misguided to eat a lot of shellfish. any comments? What would you use the crab stock for? I’m intrigued. We do chicken bone broth (a la WAP) and are on GAPS. Thank you! Represent San Francisco! I’ve never done a crab feed before, but the company I work for (i love blue sea) is getting fresh Dungeness crabs this season. Do you have any tips for side dishes/drinks to go along with dungeness crabs?